You Are Here is a survey of various ﬁgurative and abstract works from the Visual Arts Collection of the Cultural Center of the Philippines. It is a deconstruction of presence and absence, missing and found, ebb and ﬂowa—a ﬂux of coming and of going. This curated endeavor is meant to work as a dialogue between the works and the viewer, to engage visitors to make inferences and connections on how each work is situated as a part of a whole. The exhibit aims to help students and new museum visitors learn how to look at and appreciate modernist, especially abstract works, by prompting questions to reﬂect upon while looking at the pieces as contextualized in a curated show. 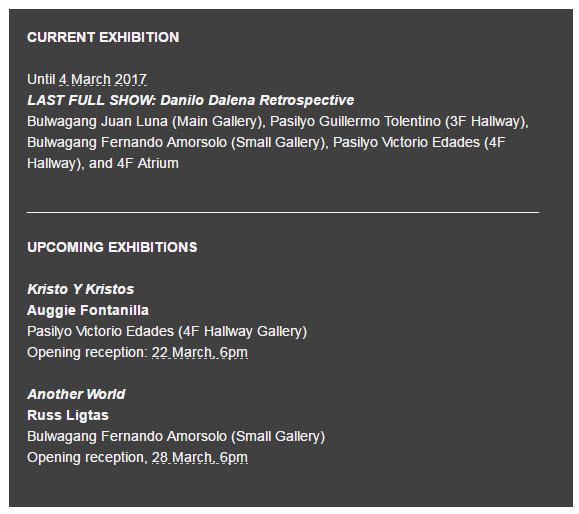 The exhibition includes works by Lee Aguinaldo, Raymundo Albano, Augusto Albor, Constancio Bernardo, Ibarra dela Rosa, Lao Lianben, Arturo Luz, Lani Maestro, and Ben Maramag. 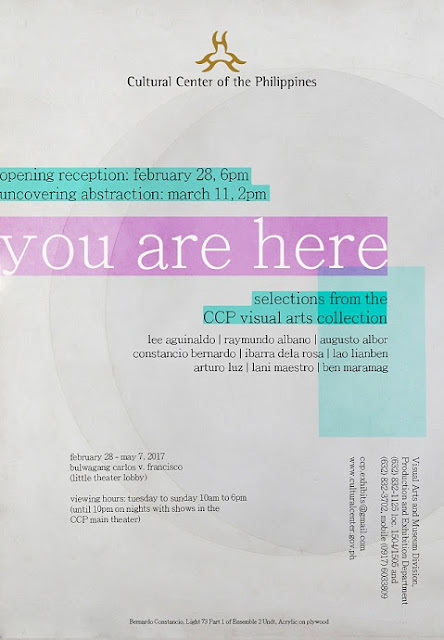 You Are Here was proposed and is curated by Arianna Mercado, an undergraduate student completing her degrees in AB Psychology and BFA Art Management at the Ateneo de Manila University. Having done an internship in the Cultural Center of the Philippines, she hopes to be able to curate various pieces from its collection to work alongside a lesson module she plans to create for senior high public school students taking art appreciation to further help the teachers lead their students to deepen their understanding and admiration for Philippine modern and contemporary art. You Are Here is the first of what is envisioned to be a regular series of proposed exhibitions from artists and curators who wish to work with the Center's Visual Arts Collection. This program is within the CCP Visual Arts and Museum Division's (CCP-VAMD) annual venue grant program. For more information, contact the CCP VAMD at (632) 832-1125 loc 1504/1505 and 832-3702, mobile (0917) 6033809, email ccp.exhibits@gmail.com, or visit www.culturalcenter.gov.ph. Deadline for venue grant proposals for the 2018 exhibition calendar is on September 30, 2017.